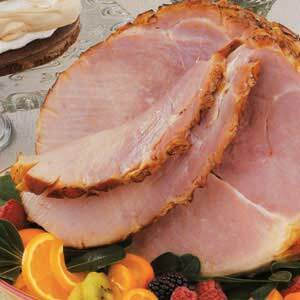 Serving a baked ham on Easter is as traditional as serving a turkey on Thanksgiving. To a novice cook, this maybe seem like a daunting task, but there's really nothing to it. Just plan ahead, marinate it for a while, then pop it in the oven! Simple, right? It turns out great every time! Of course, I love a super sweet glaze, but you can adjust the amounts of the sweet ingredients to suit your own taste. In a large bowl or large oven bag, combine the mustard, honey, brown sugar, pineapple juice and pepper. Place the ham in the marinade, turn to coat well, and let marinate for several hours or overnight in refrigerator. Turn frequently to keep ham coated with marinade. Preheat the oven to 350°. Remove ham from bowl or large bag. Place the ham on a rack in a roasting pan, reserving marinade for basting. Bake the ham, basting frequently with the reserved marinade, until a meat thermometer (not touching the bone) reads about 140°, or about 10 minutes per pound. This recipe lends itself to any number of variations. Add or switch any of the ingredients and add your favorite flavors. Try maple syrup instead of the honey for a maple glazed ham. Instead of pineapple juice, try orange juice or even pomegranate juice. To make it a little more savory, add a minced clove of garlic and about 1/2 cup dry red wine to the marinade. For a decorative presentation, score the ham with a sharp knife in a criss cross pattern before placing it in the oven. I was recently talking to Mary Beth about the recipe for Cake Balls, and she said "Oh! They look just like Oreo Truffles!" Wait, what????? I had never heard of them, and when she told me how to make them, I thought "Why have I never heard of this????" This is another one of those "how can this not be good" recipes. I described them to Daniel and he said "There isn't enough milk in the world for that!" He cracks me up. Well, yes, there IS enough milk in the world for this and you simply MUST try them. They're SO delicious. If I had to describe them, I'd say they taste like little pieces of Oreo fudge. Heavenly! Crush cookies to fine crumbs; place in medium bowl. Add cream cheese; mix until well blended. Roll cookie mixture into 42 balls, about 1-inch in diameter. I found it easiest to just throw all the cookies into a food processor and then pulse them into fine crumbs. Once all the cookies were crushed, I added the cream cheese and processed the mixture again until it was thoroughly combined. You only need about 3 cups of cookie crumbs, which is about 36 cookies. You'll have several cookies leftover from the 16oz package. You can either pour yourself a glass of milk and enjoy the extra cookies while you're rolling truffles, or you can crush them separately and then sprinkle the finished truffles with Oreo crumbs just before the chocolate sets. Place truffle ball in melted chocolate and turn to coat. Lift truffle from chocolate using 2 forks (this will allow excess chocolate to run off) before placing on parchment paper. Sometimes the best meals are the simplest. You don't need to spend hours in the kitchen with a million ingredients in order to come up with a fabulous dinner. This is so easy, it's barely even a recipe. It's perfect for a mid-week meal or whenever you're a little short on time. A little sauce, a few sausages, some cheese, and you're good to go. Simple, right? Cut sausage into lengths of 3 or 4 inches. Grill or fry until browned on all sides. Pour a little marinara sauce into a shallow casserole dish. Place browned sausages in casserole. Top with a little more sauce. Place in oven for about 20 minutes or until cooked through. Top with shredded cheese. Place in oven for about 10-15 minutes longer, just until cheese is melted and bubbly. Serve on fresh bakery rolls or with a side of pasta and some Garlic Bread. I like to use an electric indoor grill. Since it cooks everything from the top and bottom at the same time, it's done in a fraction of the time it would take to cook in a regular skillet. When you brown the sausage, you don't have to worry about cooking it all the way through. It'll finish cooking in the oven. I like to leave it in the oven for a little extra time, because it makes the cheese slightly golden and brown around the edges. Love it! Try this with meatballs too! When I first got my ice cream maker, I knew I'd eventually be trying new and different recipes. I've always loved ice cream flavors that are a little outside the box. I definitely think this one fits the bill. When I told my niece, Kelli, that I wanted to try a carrot cake ice cream, she gave me a look as if she was seeing the Holy Grail. She LOVES my carrot cake! So, of course, this is what I decided to make for Kelli's birthday. She absolutely LOVED it and I know you will too. Meanwhile, in a small bowl, beat the egg yolks with the sugars and spices until fluffy and lighter in color. While beating the egg yolk mixture, pour in a little of the hot milk mixture and continue to beat. 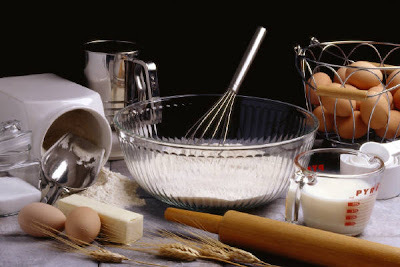 Do this a few times, adding a just a little at a time, until all of the milk mixture is added to the egg mixture. (This will temper the eggs, so that you don't wind up with scrambled eggs.) Pour everything back into the saucepan and set heat to medium-low. Cook about 8-10 minutes longer, stirring frequently with a spatula to scrape all corners of the bottom of the pot. Do not let boil. The custard should be just thick enough to coat the back of a spoon. Let custard cool completely, then transfer to an airtight container and completely chill in the refrigerator. Follow your machine’s instructions for churning length. Transfer ice cream to an airtight container and freeze for 2 hours or until it reaches desired firmness. Serve with the Cream Cheese Sauce.